On Sept. 26, Peter Fu, DipMinHous’91, returned to his alma mater to announce a landmark $12-million gift to the School of Architecture. It is a gift that will transform the lives of many architecture students, much like his own path was changed upon his arrival at McGill as a graduate student in 1990. It was Fu’s first time out of China, he didn’t know the language, and he was travelling to a city where he knew no one. “I was very nervous and I kept thinking, if no one picks me up, what will I do?” recalls Fu. Among the experiences which changed the course of Peter Fu’s life, his arrival in Montreal was perhaps the most memorable. In 1990, Fu had just received a Clifford C.F. Wong Fellowship (awarded to an outstanding graduate student from China) and he was on a flight from his native Shanghai to Montreal to study at McGill’s School of Architecture. McGill had arranged for a family (the Robsons) to provide accommodation and meet Fu at the airport, but the flight was several hours late and he arrived at midnight in Montreal – his first time away from China not knowing the language, the country or anyone in the city. “I was very nervous and I kept thinking, if no one picks me up, what will I do?” recalls Fu. To his relief, the Robsons were still there, patiently waiting for him, ready to welcome him.. It set the stage for Fu to excel at McGill, begin his career in Canada and later establish himself in Shanghai as one of China’s most accomplished architects – as well as a remarkably generous McGill supporter, donating $12 million to the University’s School of Architecture. “Canada welcomed him as a student, and he in turn is committed to strengthening the links between the Canadian and Chinese academic communities and to transforming the McGill learning experience,” said McGill Principal and Vice-Chancellor Suzanne Fortier at a September 26th news conference at McGill to announce the gift. In recognition of Fu’s vision and exceptional generosity, the School will be named the Peter Guo-hua Fu School of Architecture. A graduate of Shanghai’s Tongji University architecture school, Fu spent two years in Shenzhen before coming to Canada. It was at a time when Shenzhen was expanding rapidly to become a major economic hub and South-East China was a wild, new frontier where Fu recalls dealing with huge mosquitoes and reptiles. “When we were visiting a building site, we would have to stop and wait for the snakes to go by before continuing on to the site,” he says. Then came McGill. For Chinese students at that time, the opportunity to study overseas was rare. At McGill, Fu obtained a Certificate in Minimum Cost Housing under the guidance of his Professor Vikram Bhatt, who directs the activities of the Minimum Cost Housing Group. After graduating from McGill, Fu worked for a succession of Toronto architecture firms, culminating in a post with Toronto’s B+H. He was sent to the Shanghai office of B+H where he quickly transformed the Chinese office into one of Shanghai’s top architectural firms. He then returned to Tongji University to obtain his PhD and subsequently established own firm, K.F. Stone Design International Inc. CANADA. According to some estimates, the company has designed some five million square metres of Shanghai’s urban landscape, including many high-rise buildings. But Fu’s most innovative and ambitious venture comes from a shared love of architecture and musical theatre (his favourite musicals include “The Lion King” and “Mamma Mia”). The result of this intersection of performance and architecture is his wildly popular Music Box venture in Shanghai. The Music Box is an outdoor theatre which uses recycled shipping containers. Four containers are placed along the perimeter of a large square. Inside the square are 300 seats which can swivel, allowing audience members to turn their attention to any one of four stages where simultaneous elements of a musical are being performed. The only snag was finding a director willing to take on a show taking place on four shipping container-sized stages. “Traditional directors told me they didn’t know how to deal with this concept,” says Fu. So Fu decided to write and produce the show himself. To launch the Music Box, he wrote three musicals. The theme? Architecture. The show debuted in 2014 and quickly became one of the top-selling small theatre productions in China. Performers even include Tongji and McGill students (there on architecture internships) with a flair for singing and acting. Fu says he’s planning to expand to other cities in China including Xiamen and Shenzhen. “My dream is to have Music Box theatres everywhere – just like 7-11 or Starbucks,” he says. 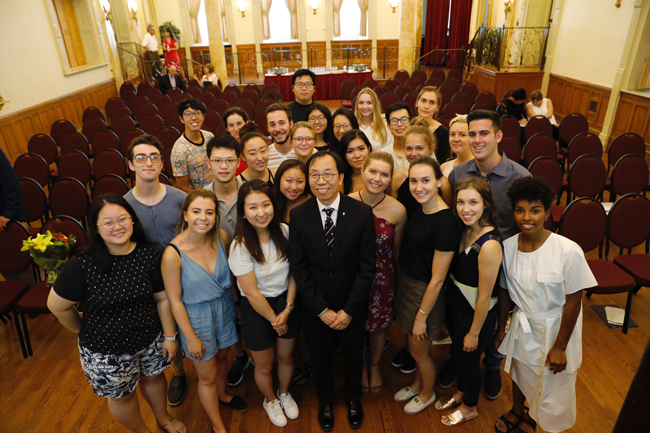 Along with his dreams for the future, Fu maintains a strong connection to his Canadian alma mater, hosting interns at his company in China and serving as adjunct professor at McGill’s School of Architecture. His $12 million gift takes his support one huge step further, and will help create scholarships, fellowships, travel awards, internships and summer research opportunities, establish chairs and professorships, promote travel and collaborative research and increase outreach through public lectures and workshops. One portion of the gift will be used to create the Peter Guo-hua Fu Fellowships to be awarded, on the basis of academic merit, to graduate students entering or enrolled in the School. Preference will be given to citizens of China. Fu also sees his mission as a graduate to be something of an ambassador and promoter for McGill, all the more important these days when competition among universities is so intense.